Lunavada (Gujarat): The forest department today confirmed the presence of tiger in a forest in Mahisagar district in central Gujarat. DCF of Mahisagar R M Parmar said that the team looking for such a beast after claim by a local teacher and photo taken by him in his mobile camera, has found its put mark in Santrampur forests this morning. His pictures and videos have also been caputured in the night vision cameras installed in that area. ‘It is after 1992 that a tiger has been seen in Gujarat. Almost 26 years ago it was seen in Dangs area of South Gujarat,’ he said. He also said that the tiger might have entered Gujarat from Madhya Pradesh or Rajasthan as tigers were present in the forests of both these neighbouring states. He said that a total of 10 night vision cameras were installed in the forests to track the tiger. Later talking to newsmen in capital Gandhinagar forest and tribal development minister Ganpat Vasava said that it was now a matter of investigation whether the tiger seen the area was alone or have other members of its family or group with it. He said that the tiger might have sneaked in to Gujarat from either Rajasthan, MP or Maharashtra as all the three bordering states have such wild animals in their forests. A tiger was capable of traveling several kilometer in a day. 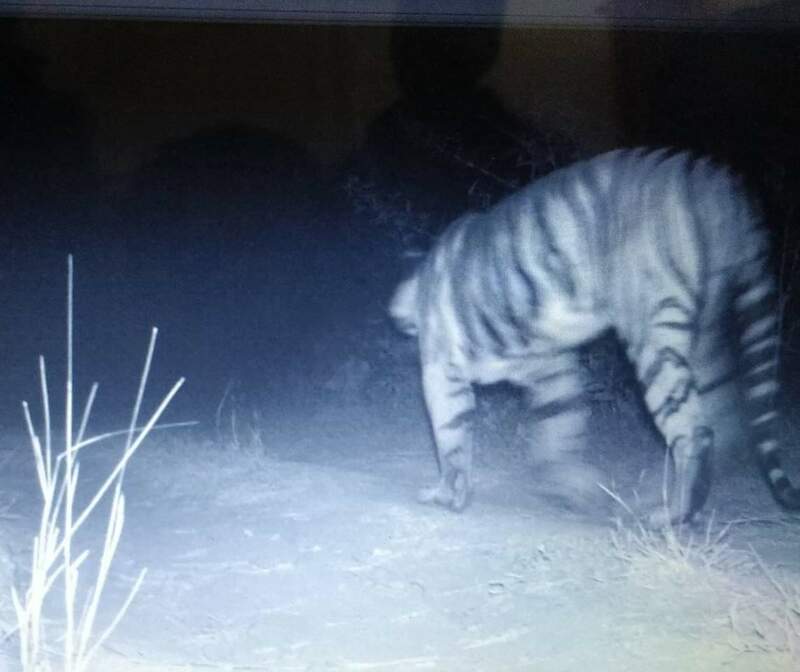 Notably, the teach in Goriya area of the distirct Mukesh Mehra had taken picture of this tiger near Gadh forest around 20 to 25 km from here in the bordering area of neighbouring Panchmahal district five days ago. He had handed it over to the forest department for further verification. Parmar said that we did not take it lightly and deployed our team and equipment to track the beast. ‘It is really a great feeling to have a tiger also in Gujarat which is otherwise known as the land of Gir lions,’ he said. Tiger has been seen in Gujarat with proper confirmation after a gap of over three decades. This tiger as per forest department’ estimate has been in Gujarat for almost a 100 days now and has killed 150 animals during its latest stay. According to forest officials, this 7 to 8 years old adult tigress and has been killing the blue bull and other big cattle in this area. Pugmarks of tigress are in size of 15 to 17 cm. 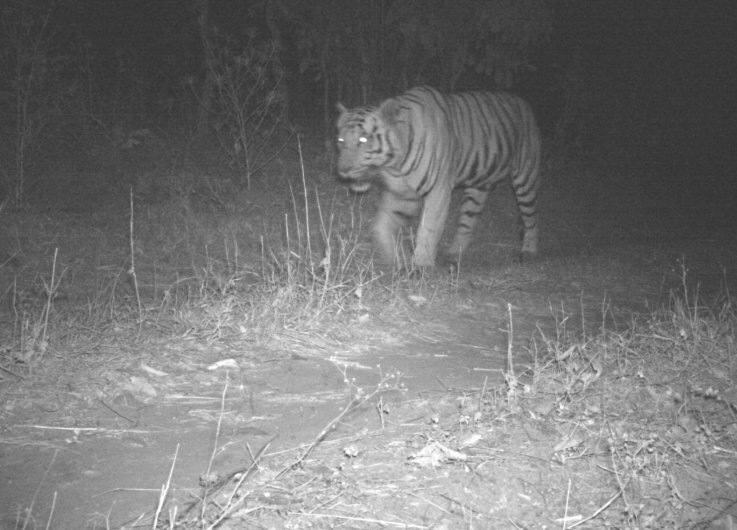 After having captured snap of the tiger in camera trap the presence of Tiger is now confirmed. It is definitely a matter of great pleasure for all of us, but at the same time it is also a time to show lot of maturity. The excitement in wildlife lovers and media persons is understandable but there is a downside to it also. Moving in the area to get snaps of the animal, pug-marks, scratch-marks, camera trap etc is not only dangerous to human life but also will disturb the animal. The animal most probably is a male entering into adulthood. This animal was last noted in Madhya Pradesh in May 2017. Such animals can easily move 40-60 Km in 2-3 days. So any disturbance will only hasten it. More importantly, giving too much information about the location of the animal could give easy hints to poachers. So it is requested that media and wild life lovers should avoid too much movement in the area and let the animal live in peace. We would also like to inform people living around the area that there definitely need to be careful but there is no need to panic. Tigers though dangerous but do not normally attack human beings. As far as cattle kill is concerned department compensates for the loss immediately.